The decision on kneeling during the national anthem announced Wednesday by NFL Commissioner Roger Goodell has elicited a wide range of impassioned responses. The new policy came after a meeting Wednesday with the 32 franchise owners and the league, though an official vote among owners did not take place, according to reports. The NFL Players Association said it was not consulted before the policy was announced. 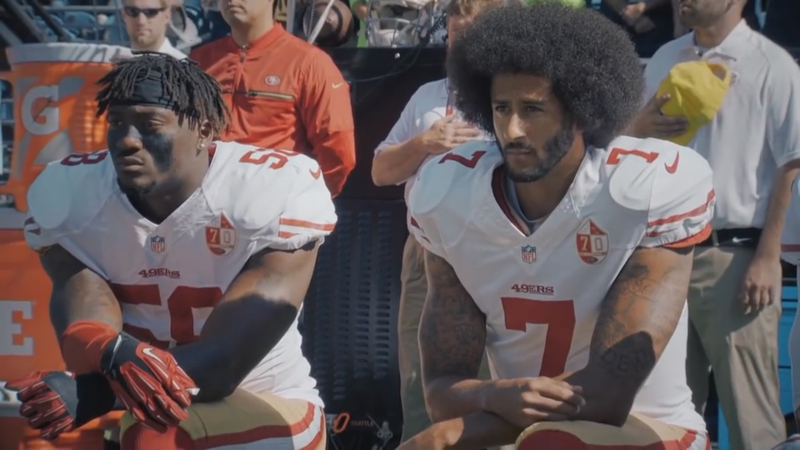 Among other items, the policy states that players cannot protest on the sidelines during the national anthem or the team will face fines. But players can stay in the locker room during the anthem. 1. All teams and league personnel on the field shall stand and show respect for the flag and anthem. 2. The game operations manual will be revised to remove the requirement that all players be on the field for the anthem. 4. A club will be fined by the league if its personnel are on the field and do not stand show respect for the flag and the anthem. 5. Each club may develop its own work rules, consistent with the above principles regarding its personnel who don’t stand and show respect for the flag and anthem. 6. The commissioner will impose appropriate discipline on league personnel who do not stand and show respect for the flag and anthem. Goodell said he believes the policy is a good one. The policy stems from actions that started two seasons ago by former San Francisco 49ers quarterback Colin Kaepernick, who knelt during the anthem to protest what he said was racial injustice in the U.S.
President Donald Trump offered his opinion of the NFL’s decision Thursday on Fox News. Exavier Pope, a legal contributor to the sports news website, The Athletic and host of SuitUP Podcast. Nicholas Pearce, a clinical associate professor of management and organizations at Northwestern’s Kellogg School of Management. He is also an assistant pastor at the Apostolic Church of God in Chicago. Eric Wallace, the president of Freedom’s Journal Institute and editor of Freedom’s Journal Magazine. His is also a pastor at Pastor of Hope Christian Fellowship on Chicago’s south side. Can Custom-Fit Football Helmets Protect Athletes From Brain Trauma? Duerson Act Debate: Who Should Decide on Tackle Football for Kids?